Jee Eun Lee helps Jessica Holtman on a placement for her project. Professor Jee Eun Lee’s passion for ceramics started off as an act of defiance. Lee’s mother and sister—both artists who knew the struggles of selling their work in a creative discipline—didn’t want Lee to experience that hardship. In turn, Lee’s family pushed her to focus on her studies. She would make her figurines and sculptures and hide them under the desk where they wouldn’t be found, she said while laughing. She began to persuade her family to let her apply to art school where she began to dive into the world of ceramics. As high school came to a close, she began to look to undergraduate programs. Jee Eun Lee helps a student with her project. “For almost two years in my high school, I think I probably spent thousands of hours to prepare that entrance exam,” Lee said. The entrance exam was for Ewha Womans University in Seoul, South Korea—the largest all-women’s school in the country. This is where she would obtain her undergraduate and master’s degrees in sculpture. It was also there that her sketches on pages and small figurines and sculptures grew in size and became life-size projects. Every semester, Lee worked on human figures to convey the duality of human beings and nature. After reading “Water and Dreams” by Gaston Bachelard, she started to ponder the idealism of nature and human life and the mixture of the two. In the essay, Bachelard talks on the “rejuvenating power of water narcissism, inevitable cycle of life and death and time,” as Lee said. This prompted Lee to begin seeing nature as a reflection of the psyche. “Basically, in art world, we are trying to make a connection between art and life and in communicating the world we’re living in right now,” Lee said. 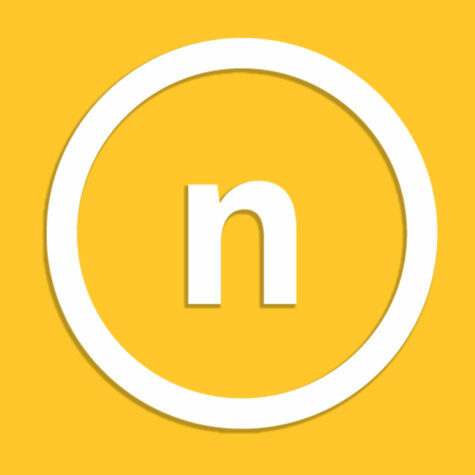 Before Lee began her teaching career at NKU, she taught in New York. With this motivation, after finishing graduate school, she left South Korea for New York where she earned her second master’s degree in ceramics from Syracuse University. After she finished the three year graduate program, she taught ceramics classes at Syracuse and Cazenovia College for three years. 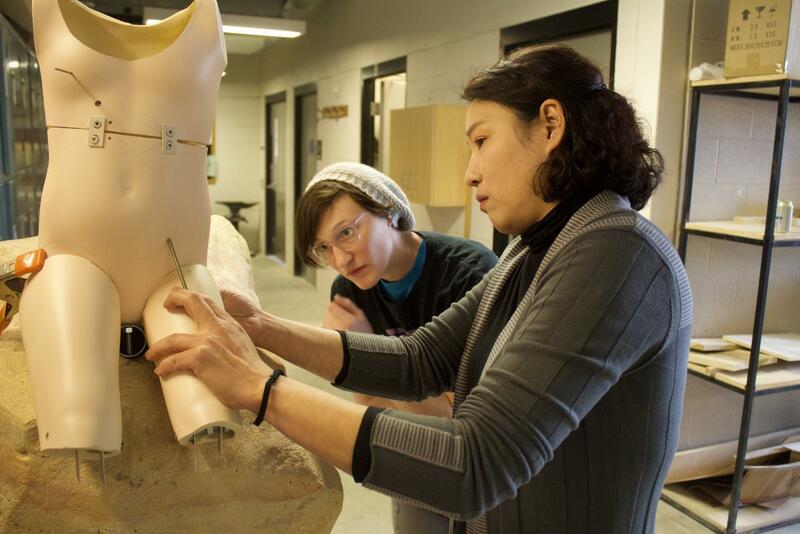 While at NKU, she looks to find real world applications of the art for her students. In the past, Lee did a partnership with the Scripps Howard Center for Civic Engagement and her students collaborated with the Newport History Museum. The museum was formerly as Southgate High School. In honor of it, Lee’s students, based on historical information, made mosaic and tile work that would go on the wall in front of the museum. TJ Dixon, junior studio arts major, said Lee shows interest in all her students’ success. Dixon said that Lee is interested in the individual’s intention with their pieces. She notes that the typical class is 80 percent studio time with some lecture. “She’s constantly walking around checking with each person, talking to each student, asking them what they want to do, giving them advice,” Dixon said. 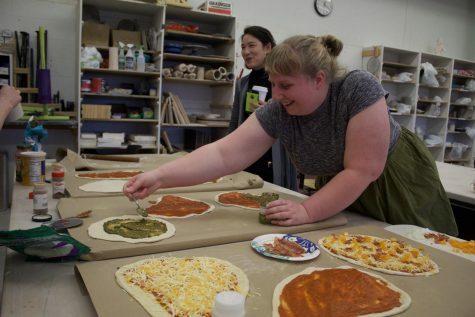 Julie King decorates her pizza as a part of their weekly pizza Fridays in the Ceramics building as Jee Eun overlooks. Holtman said Lee’s teaching helps them understand more than the figure they are creating. “She’s got a very deep understanding of, not just the figure, but the figure’s connection to the world and how the figure interacts with its environment and how you view the whole—not just the piece,” Jessica Holtman, senior spatial arts major, said. Holtman feels Lee challenges her to make the audience question the things they view through thoughts about the piece contextually and conceptually while still relating it to the audience. 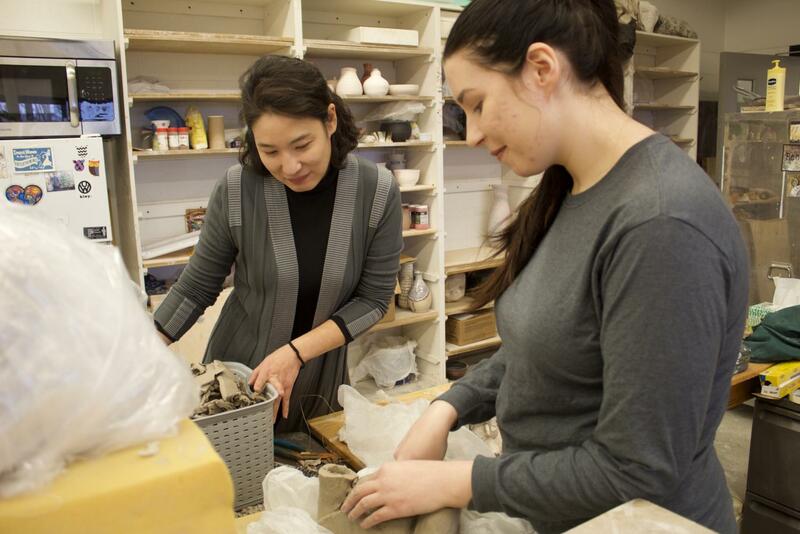 The addition Lee has brought to the ceramics classes surpasses her teaching style, and shapes the community in the spatial arts department; so much so that Holtman said there was a tangible difference in the atmosphere of the ceramics department. “The difference that she made not only in the work of the Ceramics I students, but in just the atmosphere—everybody was working harder,” Holtman said. Holtman and Ben Hubert, facilities manager, were both on the search committee that found Lee. Both said that from the moment Lee began to share her knowledge, they knew she was the right pick for NKU. TJ Dixon noted that NKU has a lot of excellent instructors on this campus. “She fits right in with that, that degree of excellence that you see,” Dixon said.